Every year, Digital Trends editors hand pick the most exciting products we’ve had the privilege of handling this year. Make sure to check out award winners in categories from cars to computers, plus the overall best product of 2017! Read on for the smart home products that floored us this year. What’s not to love about the Google Home Mini? The small, round smart speaker literally sits in the palm of your hand like a cute cloth pebble. Google’s answer to the iconic Amazon Echo Dot, the smart speaker is equipped with Google Assistant, which is getting smarter every day. 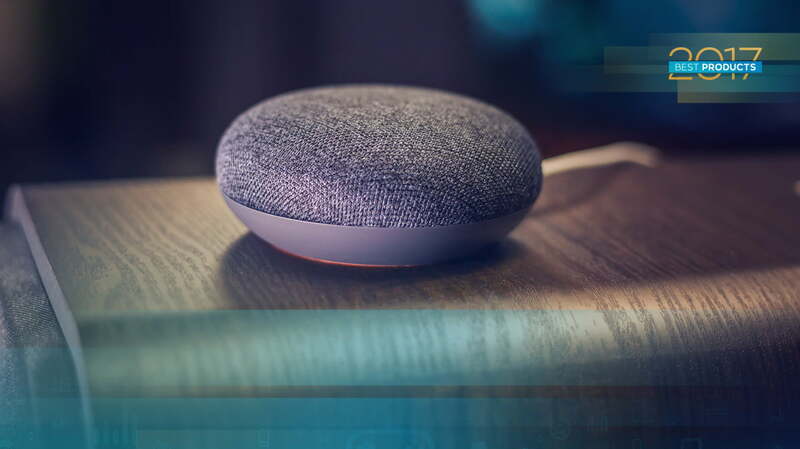 We chose the Google Home Mini because of the thoughtfulness and attention to detail on design of the compact device, as well as the smart features and capabilities Google Assistant brings to the table. Seamless integration with the Google platform also makes the Mini extremely easy to use. If you already use Google Maps or YouTube, for example, you can use Google Assistant via the Mini to access both seamlessly. You can buy the Mini in three colors – coral, chalk, or charcoal. The fabric coating makes the device feel warm, and it can sit unobtrusively on just about any surface without looking like a cold piece of hardware. The app is easy to use, and the “voice match” feature allows you to receive customized responses based on voice recognition – a wonderful thing if you have multiple users for the device. In fact, this feature was such a good idea that Amazon quickly incorporated a similar system after Google announced it. This makes things like getting traffic information for your commute — not your partner’s — as easy as pie. Seamless integration with the Google platform also makes the Mini extremely easy to use. Google obviously did its research, and realizing that kids are using smart speakers just as often as adults are (sometimes to do things like sneak cookies on grocery lists), implemented the Family Link feature, which includes interactive children’s games, storytelling, beatboxing, and more. Its cute, warm, button-like look, quality sound, and ever-improving Google Assistant features made the Google Home Mini an easy choice for the product of the year. The Samsung FlexWash washing machine (our 2017 Home Awards winner in the Home Care category) gives you the flexibility you need. It’s both large capacity and small capacity with a dual chamber for big and small loads. This appliance impresses us for a couple of reasons. First, its huge and beautiful. Second, it has two washing zones — a larger one on the bottom for typical loads, and a smaller compartment on top for things you don’t want to get lost in the main compartment, such as delicates. Use that smaller compartment to wash your favorite sweater before heading out for the night. The all-new second generation Echo is smaller and cuter than its predecessor, and with interchangeable shells that come in cloth or wood-like textures, you can change up the look of the smart speaker whenever you want. It’s not just about the device, though: The Echo lands on our list for outstanding software as well. Queen Alexa continues to grow and get smarter – at last count, Alexa had more than 20,000 “skills.” And with more and more devices adding Alexa capabilities, Alexa and the Echo are still the ones to beat for sheer compatibility.